Lucy Kelly's purchase of an iPhone 6s at the Sydney Apple Store was a global news story. The lines outside Apple Stores across the globe will be long later this year when the much-anticipated iPhone 7 goes on sale, a guaranteed media spectacle ripe with companies seeking inexpensive advertising of their products. 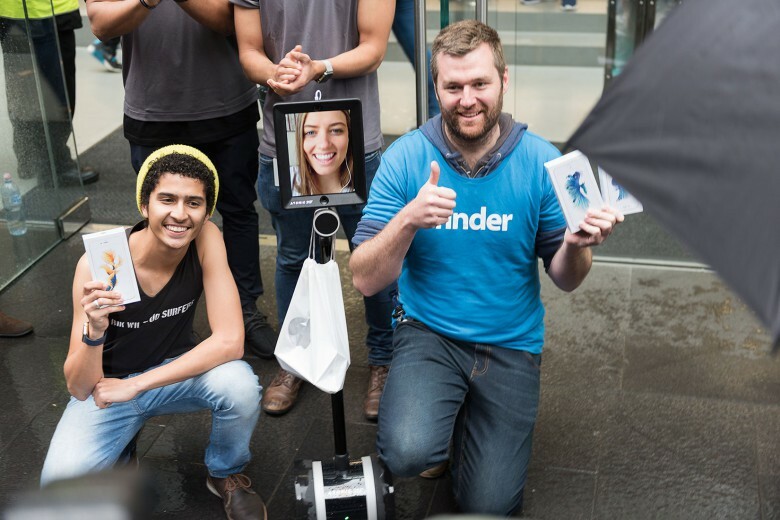 No guerrilla marketing stunt set the bar higher than one in Sydney last fall, when a telepresence robot with the cheerful face of a woman named Lucy framed in an iPad took her place in line to buy an iPhone 6s. Lucy Kelly, the marketing manager of a small media company, controlled the robot from her home, sometimes in her pajamas over breakfast. She chatted with others in line, posed for selfies, and granted interviews for stories that reached millions worldwide. This is a clever and futuristic solution to the pain and fatigue of a long wait, but it’s also more. Just her presence — her telepresence — reaped priceless exposure for Apple, for the robotics company that made the machine, and for Kelly’s employer, a tiny media company called Atomic 212, which has won nearly 40 advertising and marketing awards for Kelly. Kelly waited in the rain with the rest of the early iPhone 6s purchasers without worrying about catching cold. Atomic 212 may have written a new page in the playbook for guerrilla marketing, when a company with a limited budget piggybacks a major event to promote a brand. Companies big and small often take advantage of Apple’s product rollouts and store openings to promote goods and services. The lines are magnets for companies who provide freebies to line-sitters to wear a T-shirt or hat with the company logo, especially if they are near the front of the line and are likely to attract reporters and cameras. 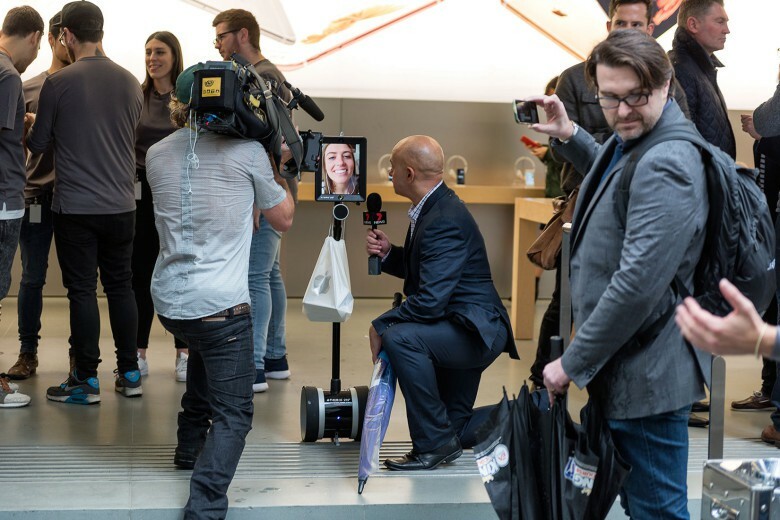 Apple knew nothing about the stunt, but after a day in line, the store saw the value in the publicity (after all, the robot’s face was on an iPad) and allowed Lucy inside to recharge her batteries. Atomic 212 had another employee on hand to watch out for Lucy and initially charge her at a nearby McDonald’s, but having endeared herself to so many in line, it was clear her new fans would keep an eye on her. Kelly was a hit and was more than happy to pose for pictures with her fellow line-sitters. 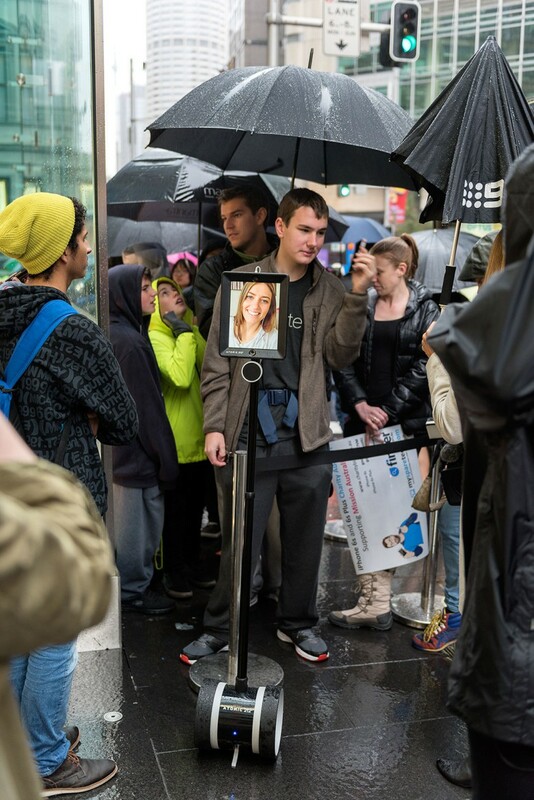 It rained most of the time those in line waited, and in feeling relieved about waiting for her iPhone at home, Kelly now wishes she could use the robot for future waits outside the Apple Store. Dooris said the exercise put the agency “on the map,” and even though he sensed there would be magic, no one at the agency anticipated the publicity and the awards that followed. The company was named “agency of the year” by a number of marketing organizations and won eight Shorty Awards, which honor the best in social media.